I subscribe to about 130 blogs and websites in my RSS reader, which I know isn’t a whole lot compared to some of you — I like to keep my reading/skimming time focused. There’s a couple sites I subscribe to that I really enjoy and read almost everything they write. 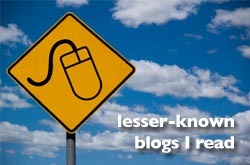 Some of them are pretty well known, so I won’t bother to list those for you, but there are some lesser-known, even undiscovered, blogs out there that are real gems. Here’s a few of them that I read. I love how these guys combine issues related to technology, learning styles, creativity and communication. They ask really good questions about what we’re doing in the church, why we’re doing it, and if it’s really the best way we can do it. I don’t remember how I found these guys (probably Twitter), but I do remember that the first post I read by them was “10 Reasons to Under-Program Your Church.” I liked it enough to tweet it, browse through some other posts on their site, and then subscribe to their RSS feed. They talk about how the church needs to become smaller in how personable it is, how it uses resources, communication, technology and more. Good stuff. And having a web design that’s pretty clean is definitely a plus, too. While I first learned about Seth Barnes and his blog many years ago when he published a response to a post I had written here at LISM, I didn’t start following his blog closely until after we traveled to Haiti together last February. After that experience with him, the things he writes about faith, missions, and life are often challenging for me. It’s too easy for me to slip back into my comfort zone of American Churchianity and Seth keeps reminding me that God wants and expects more from me than that. Thanks, Seth! What I like best about the articles here are that they’re usually short and concise. Most of their posts take me about a minute, maximum of two, to read, kinda like Seth Godin-style. Sometimes they simply ask questions, other times they write about family life, other times its good reminders about things I too easily loose sight of in ministry. A youth pastor here in Minnesota actually turned me on to this blog (thanks, Matt!). This blog is exactly where I’m at in life: a parent, a youth worker, and a guy who’s trying to explore ways to combine youth ministry and family ministry by helping parents be the spiritually influential leaders God calls them to be. Their posts relate to me on all of those levels. Sometimes it helps me be a better parent for my daughter and son on-the-way, other times it helps me think through how to work with parents in youth ministry, and most times it’s both. If you’ve listened to LIVE YM Talk recently you’ve heard this guy and know that he’s a fountain of wisdom and knowledge. He posts a lot of good practical insights and challenges about being a leader in the church. I learn a lot from this guy. If you’re not a subscriber to this blog, Life In Student Ministry, grab our RSS feed or sign-up to get updates via email. You can also subscribe to LIVE YM Talk and our videos in iTunes. Got any other blogs you read to recommend (besides your own)?